Amnesty International’s Halt The Hate website attempts to address this gap in recorded crime data. On a cold December day last year in Rajsamund, a district in Rajasthan, a Bengali Muslim migrant labourer, Afrazul Khan, was murdered. The act was captured on video and widely circulated. In the video, a man is seen hacking Khan to death with a pickaxe, ignoring his desperate cries for help. 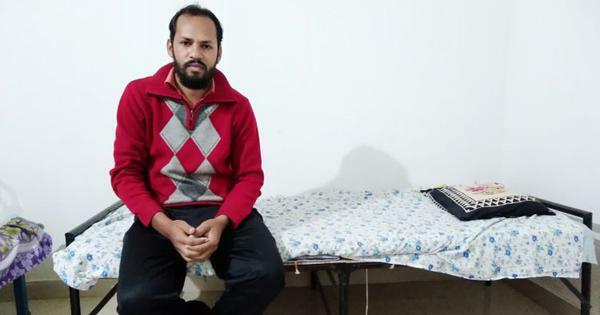 The attacker walks up to the camera and proclaims that Khan is guilty of “love jihad” – a pejorative term used to vilify marriages of Muslim men with Hindu women. He then sets Khan on fire. Later, reports emerged that the murder may have been a case of mistaken identity. The target was another man, Ajju Sheikh, who was allegedly having an affair with a Hindu woman. What did Ajju Sheikh have in common with Afrazul Khan? Nothing – except that they were both Bengali-speaking Muslims. The individual identity of the person at the receiving end of the violence did not seem to matter; that he was Muslim was enough. Thus, the two men were, in a sense, interchangeable. This attitude chillingly embodies the nature and elements of what constitutes a hate crime. The term hate crime is generally applied to criminal acts that have an underlying discriminatory motive and are targeted at people based on their real or perceived membership of a particular group, such as caste, religion, gender or ethnicity. Hate crimes do not occur randomly. They are a violent manifestation of the deep-seated prejudices that exist in societies. The kind of prejudice that leads to a six-year-old Dalit girl being forced to clean excreta outside her school. The kind of prejudice that makes people tie a young Muslim man to a tree and beat him to death for being in love with a Hindu girl. The kind of prejudice that results in the death of a Dalit woman branded a witch. A common theme across all these alleged hate crimes is the unconscionable demonisation of those who are different. In its annual report, The State of the World’s Human Rights 2017-2018, Amnesty International talks about the growing politics of demonisation, evidenced by horrific instances of rights violations reported worldwide and in India. Dalit people have been attacked for merely sporting moustaches, and Muslims lynched for transporting cattle. Hate crimes are different from other crimes as there is a discriminatory motive behind them. However, the National Crime Records Bureau does not record hate crimes as a separate offence. Crimes perpetrated against Dalits and Adivasis because of their identity are recorded under progressive protective legislation like The Scheduled Castes and Scheduled Tribes (Prevention of Atrocities) Act, 1989. Crimes against other marginalised communities, like Muslims, are not specifically recorded in light of the lack of similar protective laws. However, the Indian Penal Code has provisions, such as Section 153A, that criminalise the promotion of enmity between groups on grounds of religion, race and place of birth among others. But these provisions have often been misused to restrict freedom of expression. In October, a case was registered under Section 153A against author and activist Kancha Ilaiah for his book Samajika Smugglurlu Komatollu, which is a critique of the caste system. 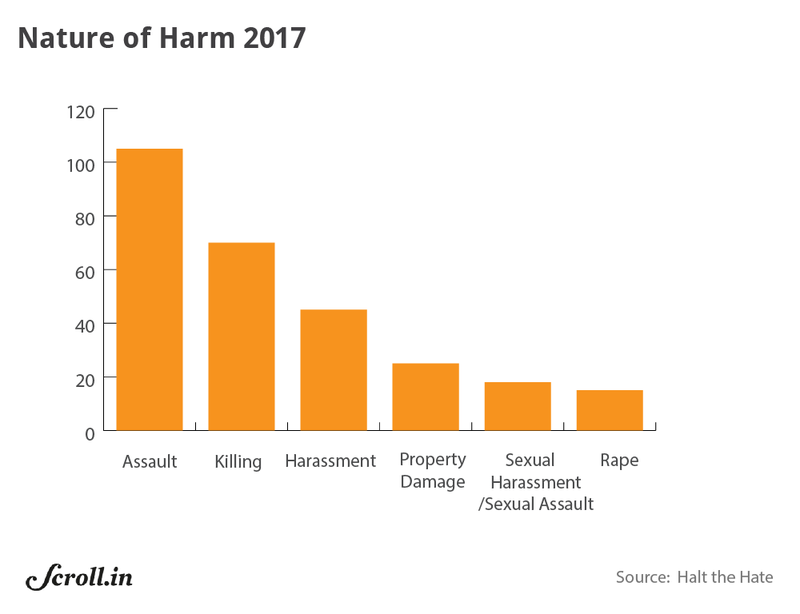 Since incidence of hate crimes in India is not systematically recorded, there is an obvious data void on the prevalence of this category of crimes. Recording hate crimes separately is essential for effective investigation, obtaining redress, and devising better policies to prevent hate crimes. Civil society initiatives in India are attempting to address this gap in recorded crime data. One such initiative is the Halt The Hate website launched by Amnesty International India. This interactive website documents instances of alleged hate crimes sourced from English and Hindi language newspapers starting from September 28, 2015. On this day, Mohammad Akhlaq, a Muslim resident of Dadri in Uttar Pradesh, was murdered in his home by a mob claiming that he had eaten beef. 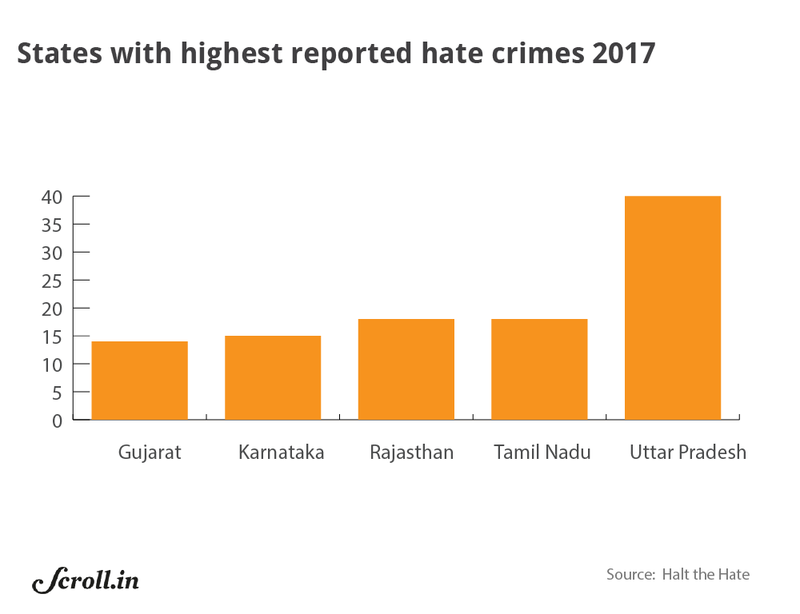 The Halt The Hate website documents alleged hate crimes against Dalits, Adivasis, Muslims, Christians, transgender people and other marginalised groups. Following the killing of Akhlaq, there has been significant media coverage of hate crimes committed across the country. 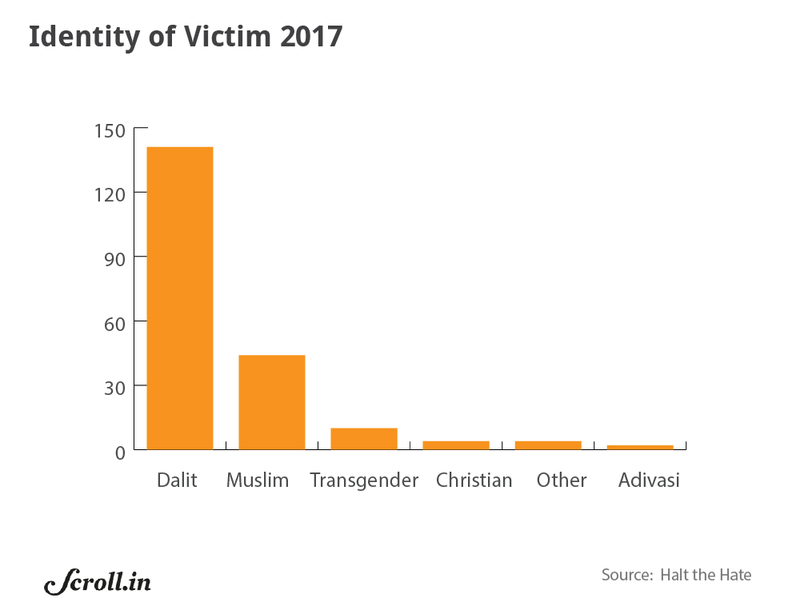 In the last three months of 2015, Amnesty International India found 33 reports of alleged hate crimes against Dalits, 14 against Muslims, and four against “other groups”. In 2016, a total of 237 alleged hate crimes were compiled from newspaper reports. The highest number of these crimes were against Dalits, followed by Muslims, Adivasis, other marginalised groups such as migrants, transgender people and Christians (in that order). 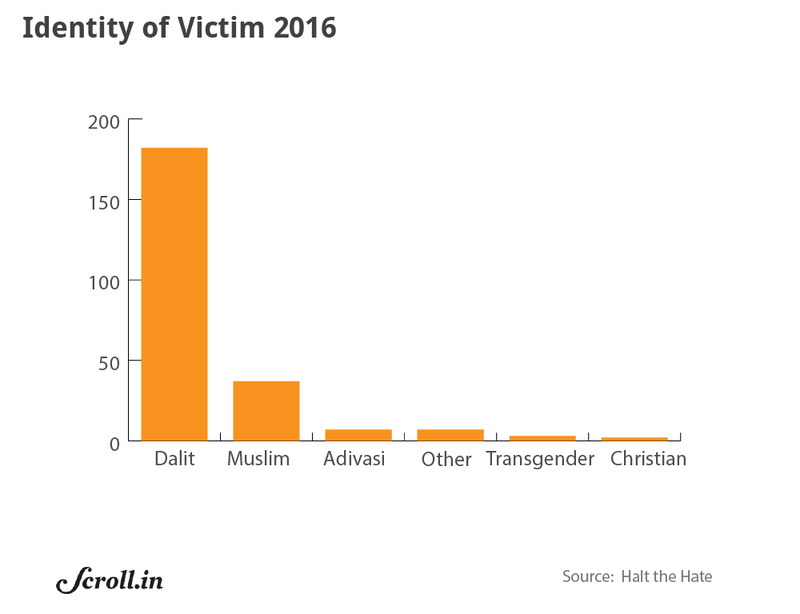 Last year, out of a total of 201 incidents reported in newspapers, the highest number of alleged hate crimes were again against Dalits. This was followed by Muslims, transgender people, other marginalised groups, Christians and Adivasis (in that order). The nature and degree of harm perpetrated against these groups is alarming – 81 incidents of killings were reported in 2016, and 69 in 2017. Women from marginalised groups and transgender people were found to be especially vulnerable to sexual violence. 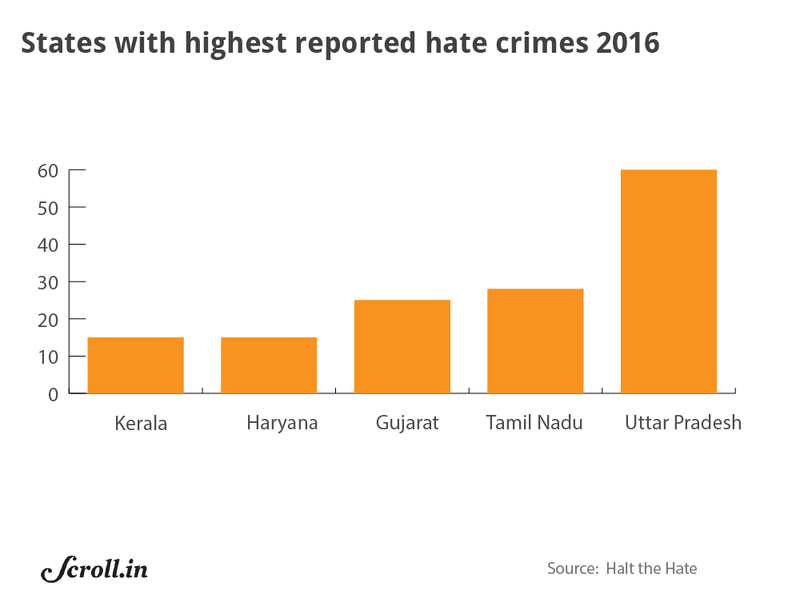 In both 2016 and 2017, Uttar Pradesh recorded the highest number of reported incidents (60 and 40) of alleged hate crimes. 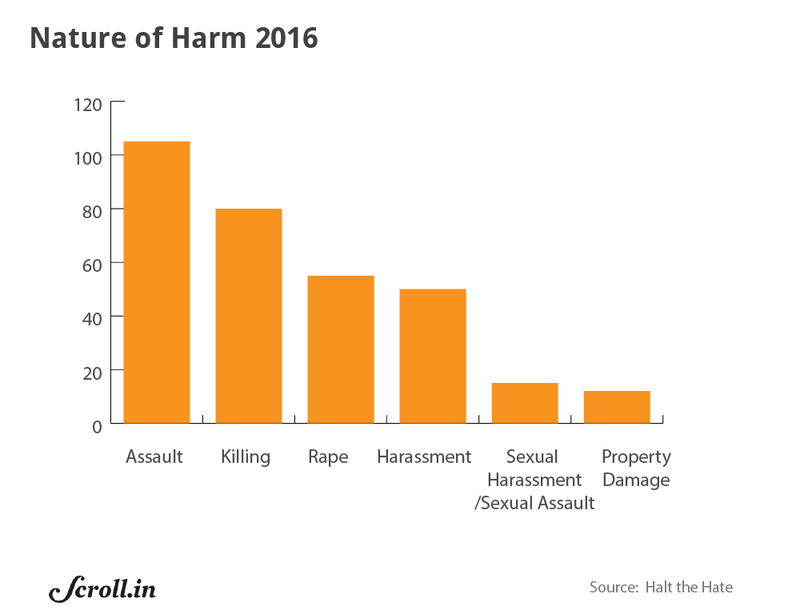 The tables below show the five states with the highest number of incidents over the two-year period. These findings are just the tip of the iceberg. The actual number of crimes committed against these marginalised and demonised communities remains unknown. What is certain is that hate crimes and the demonisation they represent is a gross violation of human rights. It is also a direct violation of the right to equality. It is daunting to think that primarily because of one’s identity or membership of a particular group, one might become the next statistic at any time. However, it is crucial to record and analyse data because data debunks the argument that hate crimes are isolated incidents committed by a “few bad apples”. 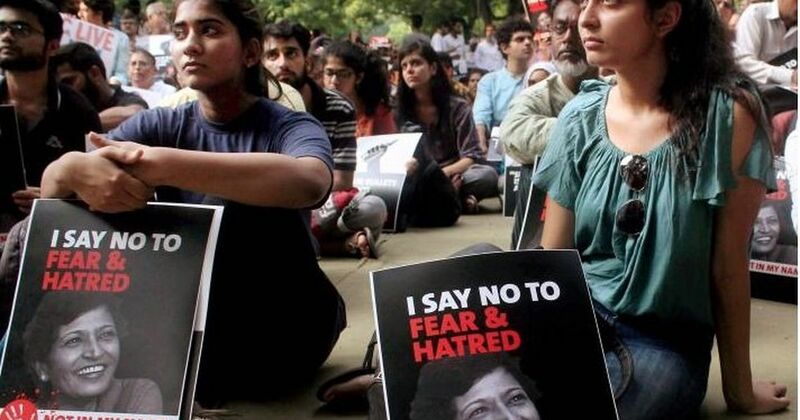 The Halt the Hate website has shown that hate crimes are alarmingly widespread in India. Now more than ever, we must hold our political leaders to account and ask them to halt the hate. Likhita Banerji works with Amnesty International India.